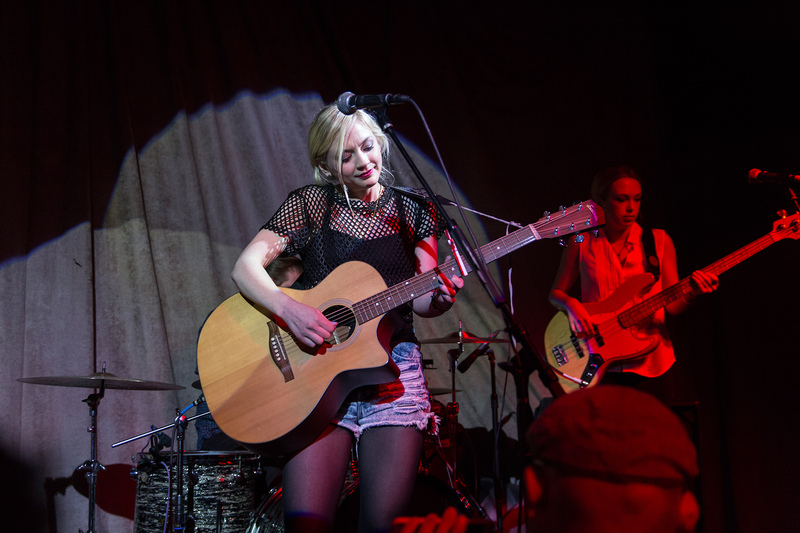 Singer/actress Emily Kinney—who you may know as the doe-eyed farmers’ younger daughter Beth Greene on The Walking Dead—recently released her debut LP, This is War, and her tour hit San Francisco on June 16th. Kinney delivered a set of peppy pop tunes, plaintive love songs, an a cappella performance, and a snappy number about a boyfriend she hoped to steal. Kinney’s guitarist, Adam Tressler, opened the show with a few solo songs, but was given the unenviable task of playing while the Golden State Warriors were winning the NBA championship on the bar TV. After the game ended, he won the crowd’s attention by singing an ode to William Henry Harrison. Solid. Teen sensation Dylan Gardner then tore through a quick set of catchy, emotive power-pop, including an Arctic Monkeys cover, before Kinney took the stage. Judging from the comments shouted, as well as the usernames of Instagrammers posting photos from the show, the crowd was heavily comprised of Walking Dead/Beth Greene fans. While Kinney is obviously most famous for her role on a wildly popular TV show, she’s doing a nice job carving out an entirely separate career in music, post-Walking Dead.